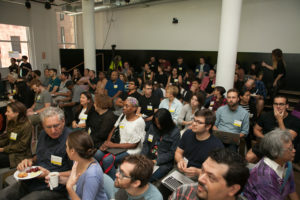 Packed house for NYC 311 Data Jam Kick off. Photo courtesy of Manhattan Borough President Gale A. Brewer. 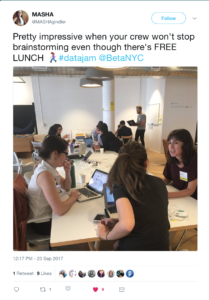 If you attended the event, and did not yet fill out the post-event survey, please visit < https://betanyc.forms.fm/nyc-311-data-jam-followup >. This past weekend, 185 participants joined 10 NYC agencies and 19 community partners to address 6 challenges or attend 3 classes. With the Manhattan Borough President and members of Community Boards we worked to improve insights around NYC 311 service request records, aka the people’s data set. 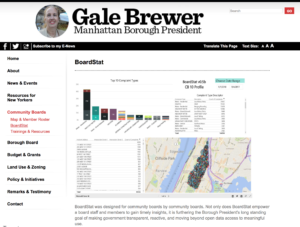 Check out BoardStat on the Manhattan Borough President’s website. We recorded the morning kick-off where Gale A. Brewer announced Boardstat, and the end of the data jam where teams shared their findings. 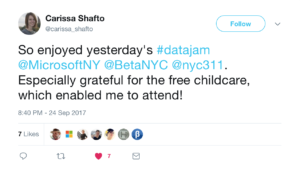 This event was our third data jam. Last year, we experimented with NYC TreesCount! This spring, we hosted a mini-data jam with NYC Planning. Our goal was to iterate around a safe space where jammers and civil servants can come together and look at a series of problems from a number of different perspectives. Additionally, we wanted to give the community a place for them to level up their technical skills. We seem to have a successful and replaceable model. This was our fourth event to offer free, on-site childcare, and found this to be quite a bit of a planning issue. We were rejected from several commercial office buildings and a few colleges because we wanted on-site childcare. Frankly, this caused an absurd amount of stress and delayed our ability to get this event kicked off in the timely manner. If our broader technology community is to be inclusive, we must fight this absurdity head on. We thank Socrata, Rise, and Sitter Studios for ensuring all of our participants could attend and have their little ones also attend. Each challenge group worked within assigned ‘wiki’-esque documents to explore questions. Here is a list of the challenges and the notes from each group! Here is a public repository for the day’s activities. What is an ideal future of NYC 311 service request data and its open data schema? What features and insights can be built into BoardStat Improvements? How can NYC 311 service requests highlight neighborhood trends and monitor affordable housing? We are in the midst of an housing crisis in NYC. Homelessness is at an all-time high, and over 70% percent of low income New Yorkers pay more than half of their income in rent. In order to address this, the Mayor’s housing plan includes building or preserving 200,000 units of high-quality affordable housing, with the majority coming from the preservation of existing affordable housing. How do extreme weather or special events impact 311 service requests? How do we identify data biases in NYC 311 data? How can 311 data be used with performance data in the Mayor’s Management Report to help inform and improve agency performance by providing predictive insight or highlighting equity issues? The Mayor’s Management Report (MMR) is mandated by the City Charter and serves as a public account of how City agencies are performing. Through reporting on performance indicators taken from 44 individual City agencies and offices, the MMR enables the public to evaluate the efficacy of City government in providing a wide range of key services and meeting its stated goals. Taken together, the MMR and NYC 311 provide a wealth of data points concerning many of the same City services, and City agencies often deploy data from both sources to help manage performance. In some instances, 311 data is even used as a proxy when more direct measurements of service outcomes or performance are difficult to collect. Thank You to our sponsors, community partners, and participants!